I started playing with a new project this week. HERE and Marys Quilt Shop HERE, but I think you have to call the shop. 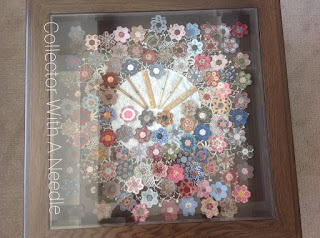 The florets I pulled from my stash of finished ones I display in my coffee table. Nothing is sewn yet. The white of the design wall will be replaced with a subtle print. I am undecided about framing the panel. I don't want it "over done" - I'm going for an antique look. Fun to play with - will see where it takes me! I shared this photo on Facebook and forgot to share it here. A friend and craftsman made these display tables for me. They have a pull out drawer about 4" deep. This is a photo looking straight down on the beveled glass top. Rather than keep my finished florets hidden away - I can enjoy them everyday. 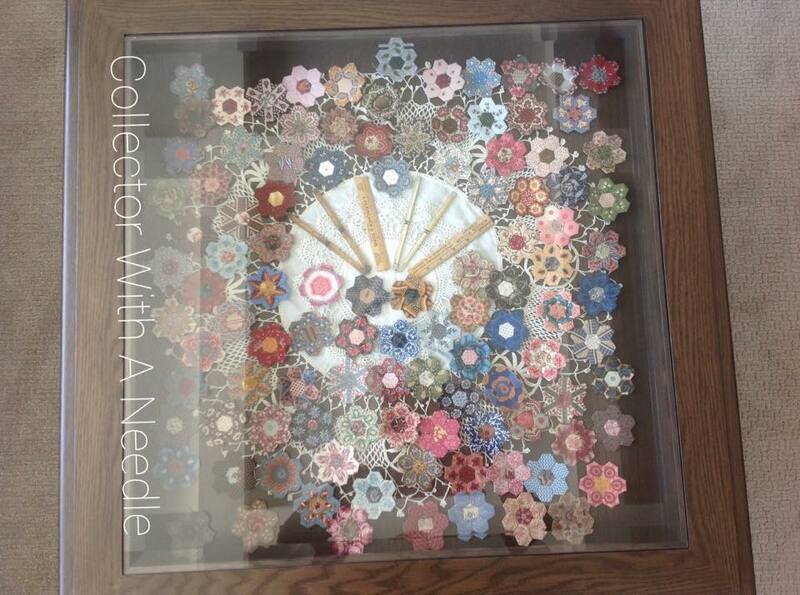 There are a few of Mr. Collectors antique rulers in the drawers, all enhanced by a 36" doily underneath. I am pleased to say I finished a big project. By finished I also mean complete with labels, and hanging sleeve. Some of you can guess from the photo what quilt I mean. Until May, it must remain unseen online. For now I have it hanging where my holiday guests can enjoy it! I was thrilled to add a sampler to my collection. 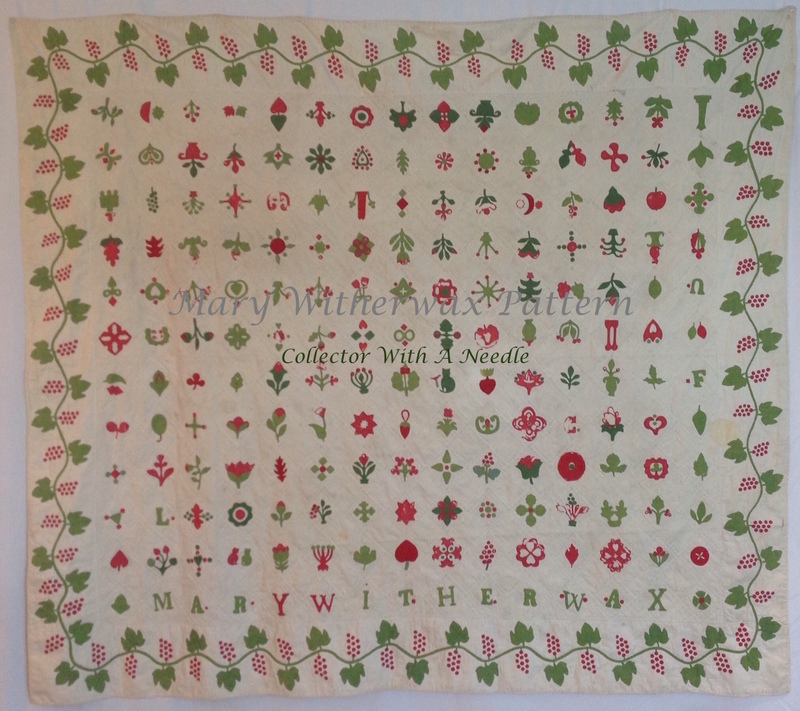 This reproduction Ackworth School sampler was stitched by Patricia Boyle (Beford Quilter) on 32 count linen. 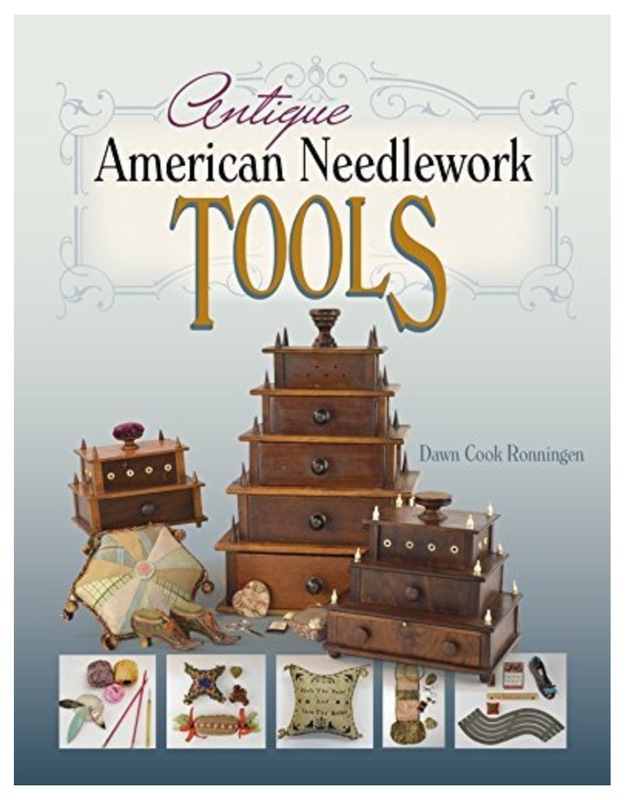 More information on the sampler and chart is found HERE. I framed it by lacing the linen to an acid free mounting board. No adhesives. The glass has a UV coating. The frame is a beautiful burl walnut I had made from a specialty company in upstate NY. They have wonderful hard to find wood molding options. This is the guest room where the sampler hangs. Not as antique themed as the other rooms. 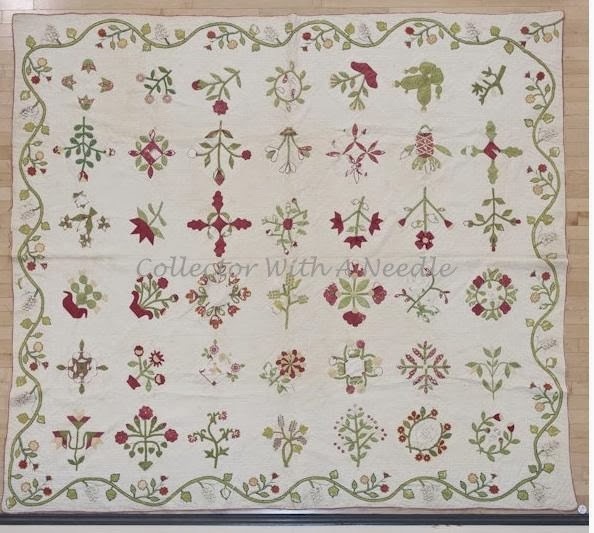 I like the colors in the sampler with the colors on the Palampore styled duvet cover. There is also a chair in this room, so I could sit and stitch in here if I want to enjoy the sampler. Always making time to stitch, heading into this busy time of the year. 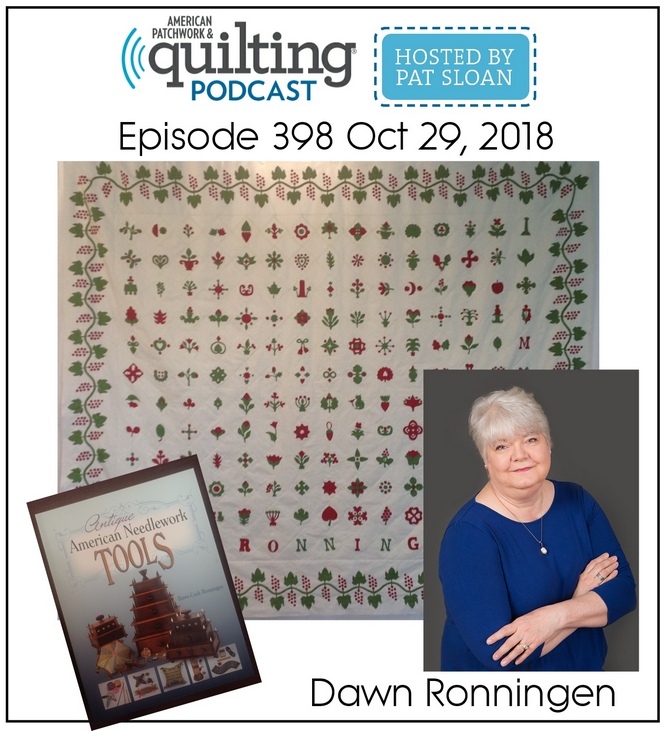 I am heads down quilting! Taking breaks and doing stretching at predetermined breaks. About every 45 minutes seems good. I am working to a deadline I am determined to achieve. This is my Shenandoah Valley Botanical Album quilt. I am entering it in the Virginia Quilt Museum Exhibit. They have asked we not show the finished top before the exhibit.